Bharatanatyam By Srihasanti is an event that took place on 27-May-2007 in Hyderabad. It must be either intimidating or inspiring or just plain dream-come-true for the girls who sit next to Srihasanti in her school. Watch the super-achiever live tonite. Shilparamam is presenting a Bharatanatyam dance recital by Srihasanti and group, this Sunday. She will be assisted by Keertana, Krishnasri, Vaishnavi and Shivani for the group items. The recital starts with a Pushpanjali, followed by Mahaganapathi, Annamacharya's Muddugare Yashoda and Cheri Yashodaku, a Narayana Teertha tarangam Alokaye Sakhi, Adi Shankaracharya's Mahishhaasuramardini stotram Aigiri Nandini, and finally the Tillana. The orchestra support for the recital will be provided by Sangeeta Lakshmi with the vocals, B Vinodini with the nattuvangam, Srinivas on the mridangam and Pavan Singh on the violin. Srihasanti is a young dancer of 11 years, who's been learning from B Vinodini since the age of 5. A child prodigy, she gave her arangetram in Ravindra Bharathi at the age of 5 years and 6 months. 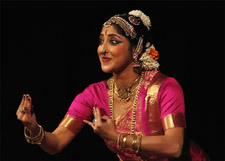 She is also learning Kuchipudi from Urvashi, Kathak from Gopal, and veena and Carnatic vocal from Vinodini. She had Kathak rangmanchpravesh during February of this year, and intends to do her Kuchipudi Rangapravesham in the next month. A student of 7th class in St Ann's School, Vidyanagar, she has over a 50 performances to her credit, having performed at Cuttack, Salem, Kothagudem, Amritsar and Srisailem, besides at various venues and cultural associations in the city. She is listed in the Limca Book Of Records for successfully attempting Shatakara Tarangini - a performance of 108 poses of stone sculpture adoring the walls of Chidambaram Temple in Tamil Nadu, for which the alloted time was 100 minutes but which she completed in 85 minutes. She has won several prizes at Salem, Amritsar, Cuttack and Hyderabad's Annamacharya Bhavana Vahini. Be the first to comment on Bharatanatyam By Srihasanti! Just use the simple form below. fullhyd.com has 700,000+ monthly visits. Tell Hyderabad what you feel about Bharatanatyam By Srihasanti!